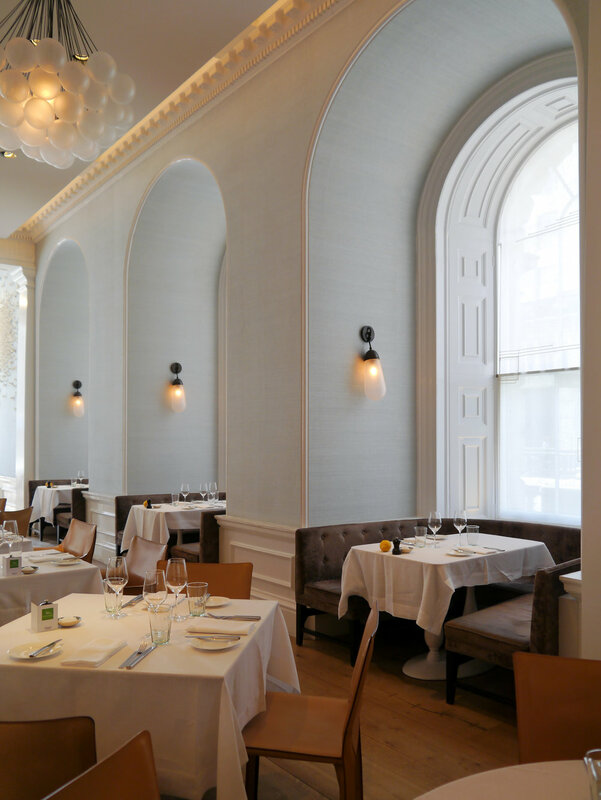 Spring restaurant by Skye Gyngell serves a daily changing menu of seasonal food in an achingly cool restored 19th Century drawing room, part of London's Somerset House on the Strand. The restaurant is blessed with huge lofty ceilings, a glass atrium and enormous windows, making the whole feel spacious and inviting. Thankfully the design by Briony Fitzgerald (Skye's sister, which makes Spring a family affair to its very core) not only echoes the name of the restaurant, the season that inspires Skye's cooking, but holds on to the feeling of space by never overcrowding the tables like so many other restaurants in London. The design is light and airy, creating warmth through the complexity of its design with texture and layers. 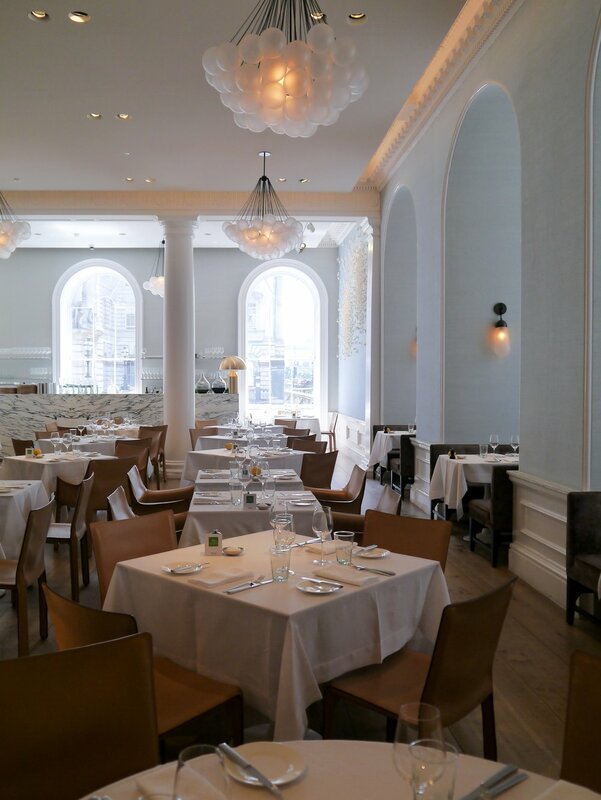 The striking porcelain blossoms blend perfectly with the blue and white grasscloth paper walls. All thrown into soothing light and shade, picking out the details, by the clustered glass cloud-like chandeliers. The furniture is a showcase of craftsmanship, with the banquets moulded to the exact curvature of the imposing columns. In the atrium , the waxed leaf and plastered all panels are framed by a canopy of olive trees, creating a more formal dining area, perfect for candlelit private dining. the whole aesthetic feels uplifting, intimate and feminine. The food is harmonious, Spring's style being to put seasonal ingredients that go brilliantly together and to not push unnecessarily beyond. It is a brave thing to do and takes a great deal of skill to pull off. The Wild Sea Bass with parsnip puree and collard greens, was a particular highlight, showcasing the heartfelt approach to beautiful ingredients. There is a fascinating wine list, with some Italian gems, with knowledgeable staff to help you find your way. This is a delightful dining experience from start to finish, a chic place for lunch or an early evening meal, an oasis on the Strand. Valeria Nascimento's Blossoms installation ans Apparatus Cloud 50 lights. Classic Atollo 233 Table lamps by Vico Magistretti for Oluce. Mayor sofas by Arne Jacobsen and Fleming Lassen and E15 Habibi tables from Living Edge. 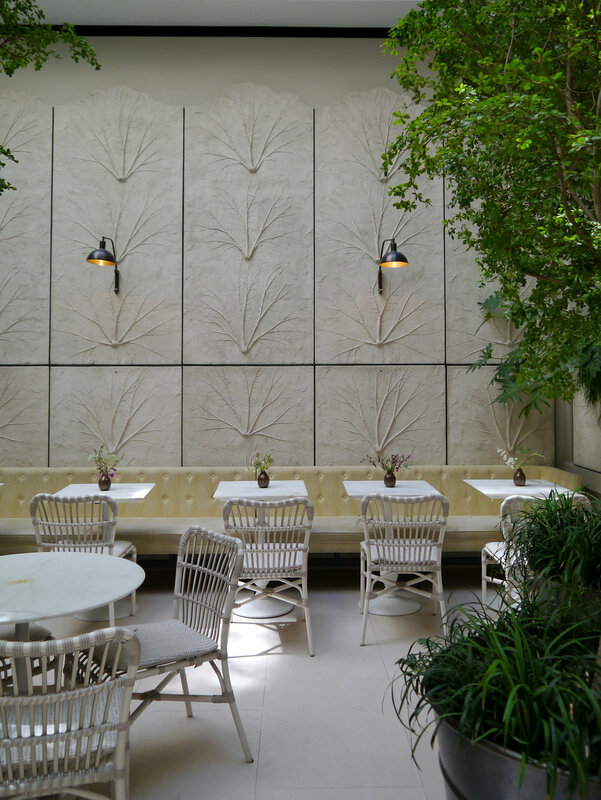 Atrium garden designed by Jinny Bloom, with Lucy chairs by Janus et Cie, and Pedrali tables. The four Images above via Paul Massey.